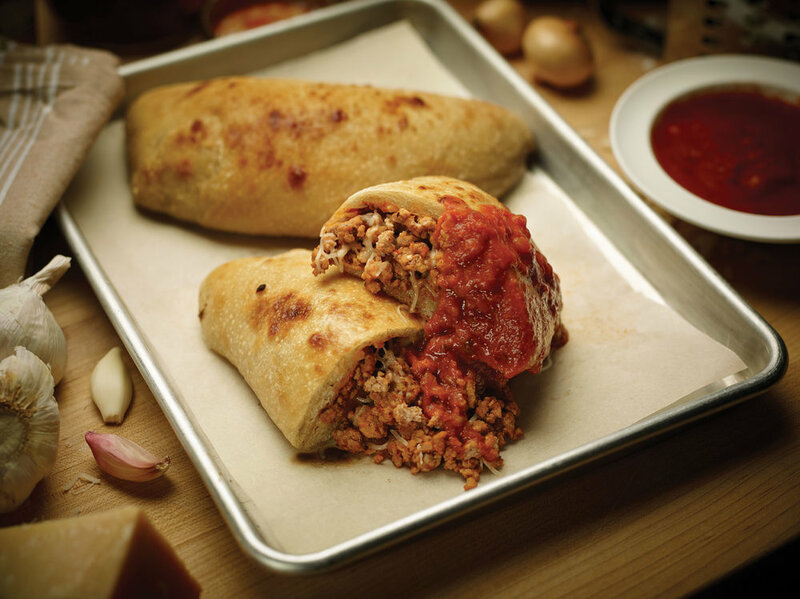 This cheesy, doughy, meaty Veal Calzone is a must-make. Not only does it ooze scrumptiousness with every bite, but you only have to prep and cook once to yield six whole calzones. That's dinner for six in less than an hour! Let the dough come to room temperature. In a large skillet, add the oil. When hot, add the ground veal and brown, about 15 minutes, adding the seasoning about halfway through the browning process. Add 1 cup of the pizza sauce to the browned veal and remove from the heat and cool. Cut the pizza dough in half and roll each piece to a 6” circle. Beat the egg and brush the dough circles. Divide the cooled veal mixture amongst the dough circles, placing it on one half of the dough. Add 2 ounces of each cheese to the top of the veal, spreading it out evenly. Fold the other half over the veal mixture. Using a fork, crimp the dough closed. Using any leftover egg, brush the top of the dough, make one of two short slits on the top of the dough to allow steam to escape during cooking. Optional: If desired, sprinkle a little seasoning or sesame seeds on top of the dough before baking. Place the calzone on a cookie sheet pan that has been sprayed with food spray. Bake in a 375°F oven for 20-25 minutes or until the calzone is golden brown and you see some bubbles in the slits. Serve the calzone with the heated leftover pizza sauce. 176 mg cholesterol; 7 g fiber.